Consider a bed or a chair, one made of wood, another of plastic, another of metal. All else being kept similar between the materials to the extent feasible, is the wood product generally the most environmentally friendly? Each material has a method of production, a supply chain and equipment and fuel and waste involved. Wood is the most renewable resource, as the wood can regrow and forests provide lots of benefits. Depending on forest management, the supply chain and overall effects of using the wood might not even be bad, aside from probably using tons of fossil fuels if it's not an artisan craft. Plastic and metal on the other hand both require more extensive processing I imagine, and both are less renewable resources. Metal is finite (though plentiful for many types) and I imagine more costly environmentally to mine and extract vs. growing, living forests. Plastic is not only using fossil fuels in production processes, but also in the very materials plastics are made up of. In terms of environmentally friendly, there are a lot of angles to look at it. Lower impact on air quality, less net carbon in atmosphere, socio-economic aspects of production and supply chain, environmental externalities (positive and negative) from the different material options. Wood is the best choice for furniture from an environmental perspective, and substituting wood where possible for other products would have a net environmental benefit. Review of the Environmental Impact of Wood Compared with Alternative Products Used in the Production of Furniture Australian Government Forest and Wood Products Research and Development Corporation. 2003. In all the examples studied, wood has been found to have the lowest environmental impact compared to other materials. Timber from sustainable forestry practices is a renewable resource whereas the production of plastics and metals is not. The incineration of timber for energy production can be regarded as CO2 neutral. The use of other materials in the production of timber furniture (such as metal and plastic trimming, glues, varnishes etc) drastically increases the environmental burden of the furniture. Life Cycle Impacts and Benefits of Wood along the Value Chain: The Case of Switzerland Florian Suter, Bernhard Steubing, and Stefanie Hellweg. 2016. In Switzerland, most of the wood is utilized in energy (approximately 50%) and paper production (approximately 25%). The remaining share goes into the production of various commodities, namely, buildings (approximately 10%), furniture (approximately 3%), and packaging (approximately 3%). 52 processes that produce 40 wood-based products covering the different sectors of the wood market up to semifinished products. End-of-life treatment (EOL) for each product was also estimated based on research on waste streams from Zurich (Switzerland's largest city, with a metro area population of 1.8 million). For each product, an average percent sent to landfills, recycled, or incinerated was calculated. 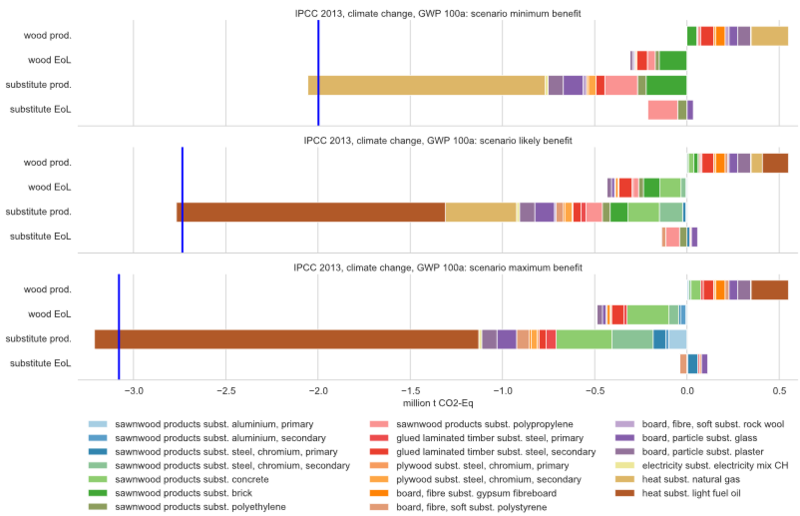 The chart shows the climate impact of wood use in three scenarios. Positive numbers show increasing global warming potential (GWP), and negative numbers show reduced GWP -- in this case, negative numbers are better. The three scenarios (minimum benefit, likely benefit, and maximum benefit) represent different levels to which wood is used to substitute for other products. The blue line shows the net effect of wood use in each scenario. Each color represents a different product that wood is replacing. From this it is clear that even when wood replaces only a fraction of the alternatives, the net benefit is a decrease in total greenhouse gas emissions. Not the answer you're looking for? Browse other questions tagged environmental-impact materials emergy or ask your own question.